EHF president Giulio Ercolessi took part on Friday in the Italian Chamber of Deputies in a conference called to mark the tenth anniversary of the law granting humanitarian protection to LGBT asylum seekers in Italy. The conference was called at the initiatve of the two former MPs – Franco Grillini in the Chamber and Gianpaolo Silvestri in the Senate – who had successfully proposed an amendment to a government bill, thus making this result possible. Together with the representatives of LGBT associations, some of the migrants who have taken advantage of the law were present and gave vivid accounts of their experiences. 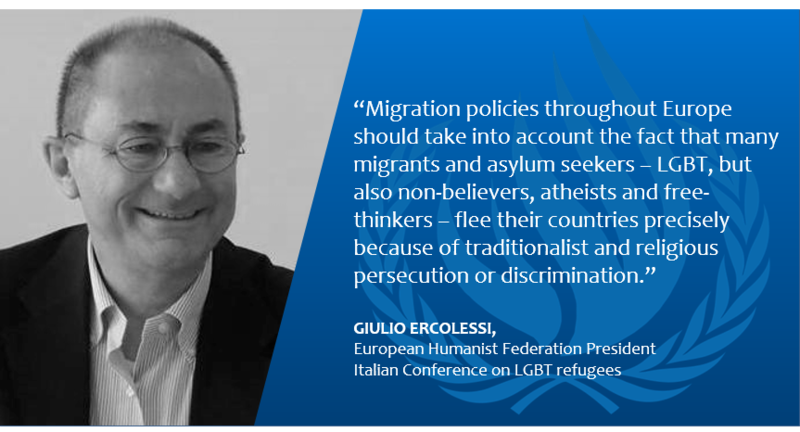 Giulio Ercolessi stressed the need for migration policies throughout Europe to take into account the fact that many of the migrants and asylum seekers in Europe – LGBT persons, but also non-believers, atheists and free-thinkers alike – flee their countries precisely because of traditionalist and religious persecution or discrimination, and in the name of the universalistic and secularist principles they deem granted in our countries. Despite the fact that many of them may not feel psychologically free to express the real motives for their escape from the beginning, and feel compelled by communitarian or family pressure to camouflage themselves in the great migration wave to Europe, our policies must not consider all migrants as representatives of the traditional cultural or religious beliefs of their countries of origin. A secular approach to migration policies, rather than an exclusive focus on “interreligious dialogue” is the only non-discriminatory path to migrants’ integration. And highlighting the great number of secularist migrants and asylum seekers who escape from religious persecution in the name of European values and legal principles can also help European public opinions achieve a more realistic view of migration, opposite to the populist narrative exclusively focused on the “clash of civilizations”, based upon religious faiths.